The ministers spelt out the cooperation priorities on agriculture, which continues to absorb close to 40% of the EU budget. Friedrich and Le Foll insisted on the “excellent” tone of their discussion and on the consensus points, highlighting the benefits of the EU's agricultural policy for the environment and in preventing food crises. “I proposed to put in place a working group on the environmental performances of agriculture to prepare the Food and Agriculture Organization of the United Nation's conference on that topic,” the French minister said. Both ministers want the European Commission to progress on the issue of food labeling. During last year's horsemeat crisis, a report was presented by the European Commission to strengthen controls on the meat trade, but little has happened since, despite repeated requests from MEPs. The topic of GMOs was also discussed, amid ongoing EU-US trade talks, which opponents fear could open a breach in Europe’s prohibition of GM crop cultivation. French and German citizens widely reject genetically modified organisms. But the German minister may have ruffled a few feathers when he stressed that agriculture should not be considered a thing of the past. “We long lived with natural agriculture, we now need to move to modern agriculture,” he said in comments likely to worry anti-GMO activists. Divisions between the two countries were even more apparent on social matters. French farmers have accused Berlin of social dumping by employing low-cost EU workers in abattoirs located in the Eastern part of the country. But the issue is no priority for Friedrich who describes himself as “the economy minister for rural zones in Germany". “We want to avoid social dumping but there are situations where employment should not be jeopardised,” Friedrich stressed. Farms are both smaller and less modern in Germany's former communist, eastern Länders than in the west. Wages there are lower, which has fuelled criticism by the French, who denounced the social dumping of East-German farmers. In the slaughtering sector, wage disparities have led to a deep transformation of the sector. Germany currently slaughters 50 million pigs a year, while the figure has dropped to less than 30 million in France. French farming unions are quick to blame Germany for this. Despite the announcements, they doubt that Chancellor Merkel's new government coalition really has the intention of putting in place a minimum wage across the country. French farming unions and the food sector are pushing for new fiscal measures and have applied pressure on the ruling socialist party by suggesting they could punish them at the next elections. “If labour costs do not evolve, don’t be surprised if the industry starts using more and more posted workers,” warned Philippe Mangin, of the COOP farmer's union. 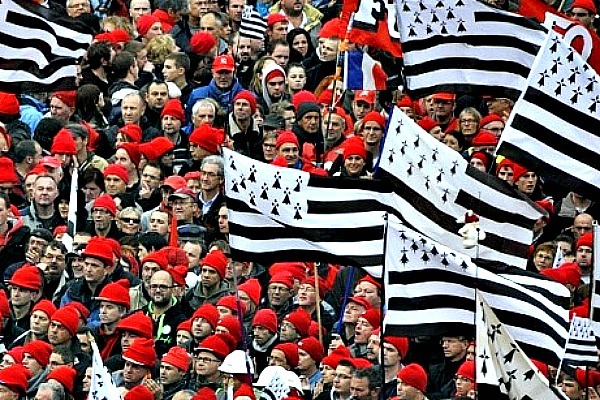 Beulin for his part warned that “when the pressure is mounting, attention should be paid”, hinting at the massive demonstrations that took place in Brittany last autumn against the new taxes announced by the government. The unions further raised the pressure by denying any responsibility for the rise of anti-European and extremist movements, such as the far-right, which attempted to ride on the Brittany farmer's protests. “We are not responsible if political parties take advantage of the movements,” Beulin warned, adding that farmer's unions would raise social issues as part of a wide-ranging consultation of the agricultural sector scheduled in March. The timing of the consultation is no coincidence and analysts say it could prove highly uncomfortable for the ruling Socialists, who are facing a key local election at the end of March, just before the European elections in May. At around €53 billion a year, The CAP is the European Union’s most expensive programme, currently representing some 40% of the EU's long-term budget for 2007-2013. This, however, compares to nearly 71% in 1984. The figure is estimated to fall to some 36% in the post 2013-reform. The new policy directions are now being debated between the European Parliament and the EU's 28 member states in view of an expected approval by end 2013. Challenges for agriculture in Europe include the need to double world food production by 2050 to cater for population growth and wealthier consumers eating more meat in the face of climate change impacts (loss of biodiversity, deteriorating soil and water quality). Were the positives in the meeting not much stronger the differences?